We were recently asked by one of our clients to undertake the refurbishment of a staircase. The aim was to brighten up and modernize the space which sees high volumes of foot traffic, whilst maintaining practicality. The stairwell was to be refurbished during term time and with up to 500 students and staff using the building at any one time, this meant our installation team needed to work like clockwork! A strict programme was devised which involved shutting parts of the stairwell between certain hours and redirecting traffic with signage and barriers so that we could carry out the install. The original stairwell flooring was mixture of sheet vinyl and asbestos tiles. Once we had the Asbestos professionally removed and disposed of we were faced with covering up old residues and a flaking sub floor. The right sub-floor preparation was essential, the correct leveling screed was identified and applied, meaning we knew we had a sound base ready to apply our finishes. The Vinyl chosen was form the Forbo Eternal collection, and for this type of environment was the perfect choice. The vinyls high tech wear layer is key to its long term appearance retention capability. Meaning even after many years of intensive use, the vinyl will still look good. To finish, we installed aluminium stair nosings. 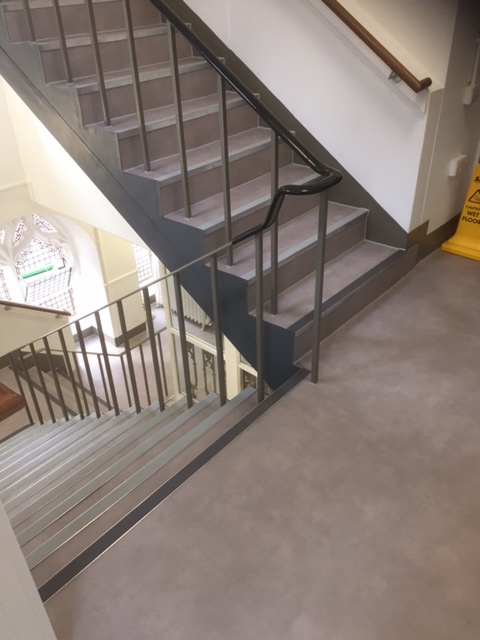 Because of our strong relationships with the leading brands a member of the Gradus team came to site, carried out a survey, and produced a measure report for us. This meant that the nosings could be pre-cut off site, and delivered for us ready to fit as and when we needed them. This made the installation of the nosings a very smooth and efficient process and really helped with the strict programme. Another great job delivered by Aztech.